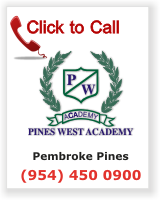 Pines West Academy is open from 7:00 AM to 6:30 PM. Monday through Friday. PWA is a full-service preschool that operates for 12 months. Accordingly, each child that registers is enrolling for the entire school year that runs August through July. This includes the summer term. A non-refundable registration fee is necessary prior to or upon initial enrollment to reserve a place for your child at Pines West Academy.